Valeska Paris and the Scientology cruise ship: What happens onboard? What Do You Do on a Scientology Cruise Ship? Photograph by Steve Mason/Thinkstock Images. An Australian woman claims that the leader of the Church of Scientology forced her to spend 12 years as a working prisoner on a church cruise ship, after her stepfather committed suicide and her mother publicly blamed the church. What do guests do on a Scientology cruise? They hang out in the Starlight Room, play shuffleboard, and achieve Operating Thetan Level VIII. To an outsider, the Freewinds looks just like any other cruise ship. In fact, it was an ordinary cruise ship called the MS Bohème before the Church of Scientology bought it from Commodore Cruise Line in 1985. It has a shuffleboard court on the top deck, a couple of restaurants, swimming pools, hot tubs, and a night club that features either the regular band or a local group from the ship’s current port. (Tom Cruise once took the microphone in the Starlight Room for a pitchy birthday rendition of “Old Time Rock and Roll.”) But a trip on the Freewinds is nothing like a Carnival cruise. Scientologists board the ship to progress in their spiritual studies, and their activities are tightly scheduled. Most days, they are in lecture halls or counseling sessions from 9 a.m. until 10 p.m., with one-hour breaks for lunch and dinner. Playing hooky to bum around the pool is not an option. Supervisors take roll call at the beginning of each session, and tardy students are sent to ethics officers. The Freewinds’ biggest draw is that it is the only place where an adherent can complete the coursework to achieve Operating Thetan Level VIII, the highest degree of spiritual achievement currently available in Scientology. Coursework on the Freewinds is a combination of independent book study, cooperative activities, and personal counseling sessions. In lecture halls, students complete lists of assignments that include reading book chapters and using modeling clay to demonstrate their understanding. They also participate in “training routines” to improve their communication skills. Classic examples include staring another student in the face for hours without blinking, or reading Alice’s Adventures in Wonderland to each other. In the counseling sessions, Scientology officers probe students for any psychological resistance to doctrine or ethical lapses, many of which include communication with or sympathy for the church’s enemies. (The organization counts among its enemies governments and reporters, whom they refer to as “merchants of chaos.”) Students in counseling sessions are required to hold onto the famous e-meter, which is a lie detector, of sorts. 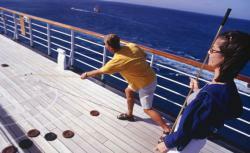 Cruise guests have a few opportunities for recreation. The cruise director might schedule workout sessions for the morning before classes start or a cabaret in the Starlight Room after 10 p.m. Saturday mornings are sometimes open for approved excursions like snorkeling or shopping on the island. (According to one former guest, the cruise director encourages on-shore excursions, because it looks strange when a cruise ship docks but no one gets off.) Students might also have a few hours to kill while waiting for a counselor to become available. Getting to Operating Thetan Level VIII is neither fast nor cheap. Most guests spend two or three months onboard. Preparatory and onboard counseling each cost between $15,000 and $30,000. Accommodations run about $1,000 per week, including food. In addition, representatives from the International Association of Scientologists ask for donations on top of what guests have already paid. Movement on and off the ship is limited, in large part because guests surrender their passports to church officials when they embark. The Freewinds is a private ship, and guests come aboard by invitation only. Scientologists have brought their non-believing friends and family aboard with the church’s approval—Penelope Cruz was on the ship with Tom Cruise—but the church tries to sell them services and seeks donations from them once on the ship. In addition to the ordinary spiritual education cruises, each year the Freewinds hosts Scientology’s glitterati for a cruise commemorating the ship’s maiden voyage. Explainer thanks documentarian Mark Bunker and former Scientologist Michael Pattinson.